Sayyidna Hasan Bin Sabbah | Ismaili.NET - Heritage F.I.E.L.D. 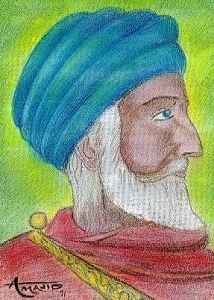 Hasan bin Sabbah was born in a Shiite family on 428/1034 at Qumm. His father, Ali bin Muhammad bin Jafar bin al-Hussain bin Muhammad bin al-Sabbah al-Himyari, a Kufan of Yamenite origin was a learned scholar. From early age he acquired the rudiments of formal education from his father at home. When he was still a child, his father moved to Ray and it was there that Hasan bin Sabbah pursued his religious education. In his words Mowlana Abdur Razak Kanpuri on behalf of Sayyidna Hasan bin Sabbah says: "Khawaja Nizamul Mulk and Hakim Umar Khayyam are those sky shining stars who came to be known as radiants of an empire. In comparison to them, after some frustrations, Hasan bin Sabbah achieved, that success which was only the result of his virtues and skill, extraordinary wisdom and God given intelligence."